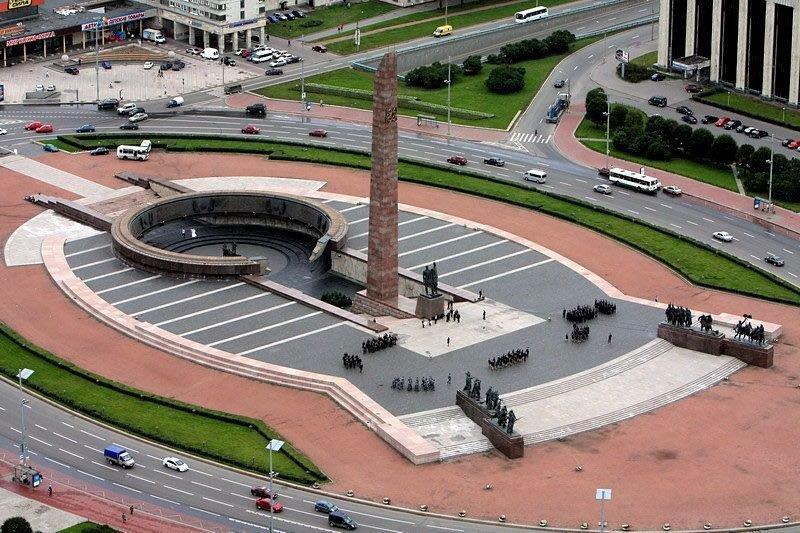 Built during the early 1970s, and completed in 1975, to commemorate the victims of the Siege of Leningrad and its survivors this monument, sometimes called the Victory Monument, is a focal point on Ploshchad Pobedy and is prominently seen by people entering St Petersburg from the airport or the E-95 highway. It was designed by Sergei Speransky and Valentine Kamensky, with sculptures executed by Mikhail Anikushin. Sculpture of a pilot and sailors. Sculpture of casualties in the city. Sculpture of two defenders side by side. A 48 m. (157 ft) high obelisk of red granite is near a vast circular enclosure which symbolises the vice-like grip of the siege on the city. An underpass on Moskovsky Prospect leads to a gloomy subterranean Memorial Hall where solemn music gives way to the persistent beat of a metronome, the wartime radio signal that had been intended to represent the city’s defiant heartbeat. Lighting is subdued, provided by 900 dim orange lamps, one for each day of the siege. On the marble walls are tablets inscribed with the names of 650 Heroes of the Soviet Union who were awarded the title after the war, while, on the far wall, a mosaic depicts the women of the city greeting their returning soldier menfolk at the end of the war. Around the hall there are small displays of artefacts recording the contributions of different community groups to the war effort. For example there is Dimitri Shostakovich’s violin as a reminder that, at the height of the siege in August 1942, a live performance of his Seventh Symphony was broadcast to the world from the Great Hall of the Philharmonic in the city – a display of defiance. A poignant display is a tiny piece of bread showing how small was the daily ration received by many people. Following the end of the war in Europe the practice arose for a parade to be held on Nevsky Prospect on May 9 (the date Russians regard as the end of World War II in Europe - not May 8) of survivors of the siege, in their diminishing numbers as the years have gone by. Ex- service survivors marching on Nevsky Prospect - May 9, 2005. Surviving civilians marching on Nevsky Prospect - May 9, 2005. The Siege of Leningrad was a prolonged blockade by the German Army of Leningrad (St Petersburg) which began on 8 September, 1941 when the last road to the city was severed. The siege was not lifted until 27 January, 1944. It was one of the longest and most destructive sieges in history, and possibly the costliest in casualties suffered. Over one million civilians perished while 300,000 Soviet soldiers died defending the city or attempting to raise the siege.